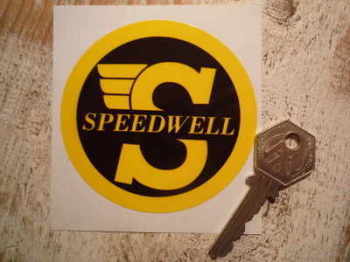 Speedwell - I Say Ding Dong Shop - Buy Stickers, Decals & Unique Automobilia. Speedwell Black & White or Green & White Circular Sticker. 3.25". Speedwell Boot Badge Replica Laser Cut Self Adhesive Badge. 124mm. Speedwell Round Laser Cut Self Adhesive Badge. 20mm or 44mm. Speedwell Yellow & Black Circular Stickers. 3.25" Pair. Speedwell Yellow & Green Arrow Stickers. 6" Pair. Speedwell Yellow & Green Circular Sticker. 3.25". Speedwell Yellow & Green Circular Stickers. Set of 4. 2".